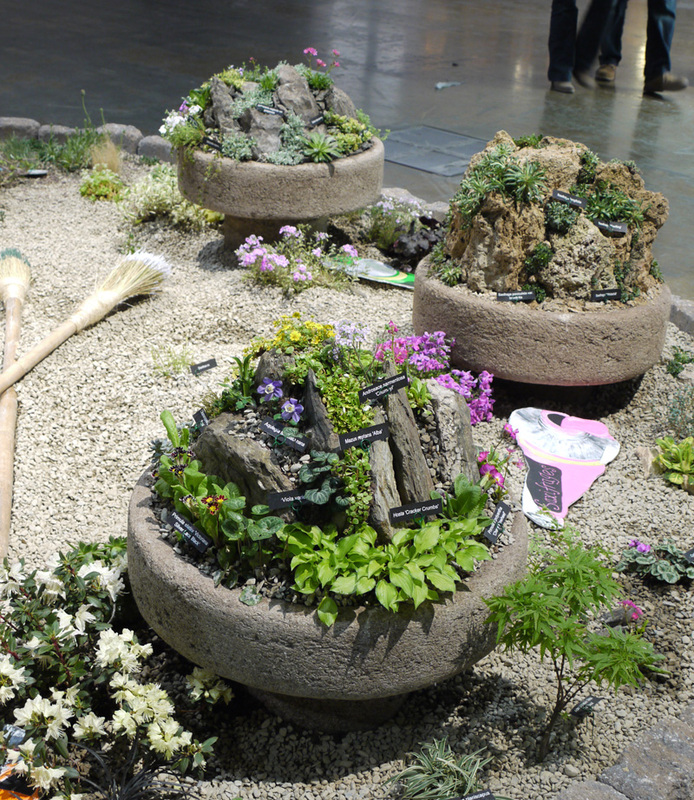 Every year, DVC-NARGS assembles a display at the Philadelphia Flower Show. The displays are designed, assembled, and staffed by chapter members. As an example, we will describe our exhibit from 2014. Our 2014 exhibit was in the form of an artist's palette. The paint spots were represented by hypertufa troughs on pedestals. Each trough featured small but prized plants from a single continent. These plants thrive in the good drainage and protective environment that troughs offer. An additional trough featured saxifrages, beautiful but challenging plants that need special care and superb drainage. As in many rock gardens, the troughs were integrated into the landscape with gravel gardens. Our exhibit at the 2014 Flower Show. 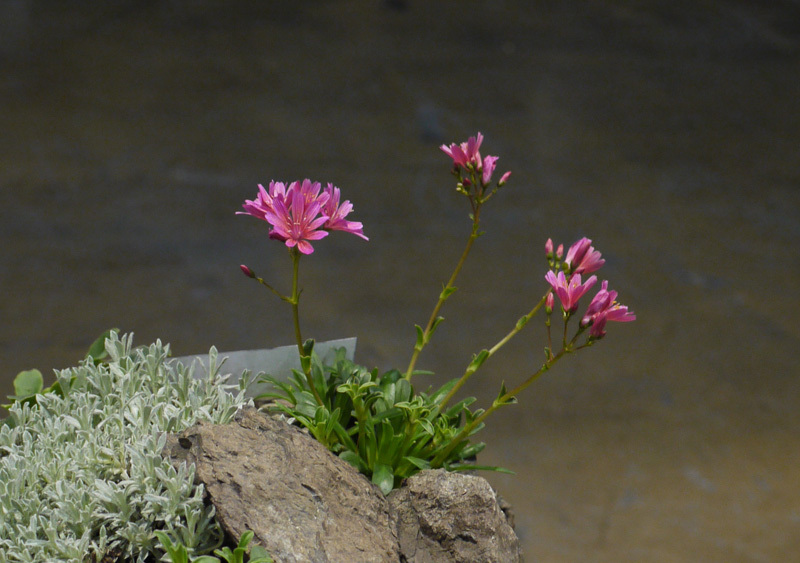 Rock garden plants are small, but they often have full-size flowers, making them the jewels of the garden. 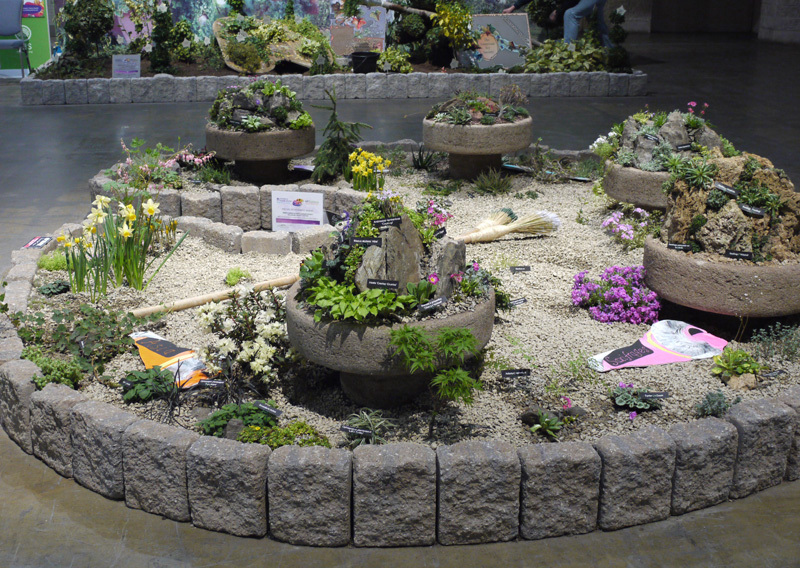 Our flower show exhibits typically include more than 100 different types of plant. Download the 2014 plant list. Lewisia 'George Henley' in the North American trough. Over a hundred years ago, gardeners in England discovered that stone troughs, used centuries ago to water and feed animals, make excellent homes for small rock garden plants. Over time, they became scarce and expensive, so gardeners developed hypertufa substitutes. Hypertufa is a variation on concrete, made of cement mixed with peat moss or other natural material, and not difficult to craft. More information on trough-making can be found on the NARGS web site. Gardens in miniature: hypertufa troughs. In the foreground is the Asian trough.